Saugatuck Art – Galleries, Shops, Studios and Great Food! A city with a unique artistic focus, Saugatuck attracts visitors from all over the upper Midwest – and well beyond! The area is known as Michigan’s Art Coast for good reason. From galleries to art schools to drama and theater, Saugatuck has a vibrant artistic community that brings visitors and artists together like nowhere else! Visitors to Saugatuck enjoy the many galleries and presentations that cater to all kinds of artistic tastes. With so many unique art centers and shops, a trip to Saugatuck always reveals something new. And with plenty of off-street parking and many locations within an easy walk of Twin Oaks Inn, guests can easily spend days wandering the streets, visiting shops, restaurants, and galleries. After wandering through the shops and restaurants all day, many visitors take in an evening play or theater production. Saugatuck is also home to many renowned art schools. These are open to visitors and offer insight and inspiration to all. Workshops and private lessons are available. The Saugatuck Center for the Arts (SCA) began with the notion that a great arts community should have a robust art center. Through the years, the SCA has built a national reputation for hosting art exhibits, stage dramas, concerts and music events and much more. A trip to Saugatuck should include a visit to the SCA. Returning visitors usually check out the SCA because something new is always going on! View the schedule and arrange your visit today. Ox-Bow offers courses ranging from ceramics and glass blowing to painting and photography. On select Friday evenings through the summer, the artists open their studios to visitors. The glassblowing and metalwork areas also feature live demonstrations. This is all topped off by a live auction of student, faculty, and staff artistic work. Looking to grow your own artistic and expressive abilities? Each summer, the school brings in distinguished historians, critics, and artists to share their work and ideas. There is something for every current or emerging artist, so check out the summer course schedule to find out more. 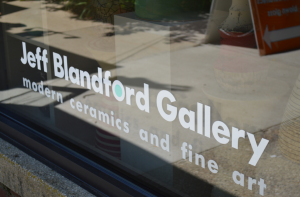 The James Brandess studio and gallery is located in what was once the Saugatuck Post Office on Butler Street. The studio features original artwork, reproductions, giclées (“zhee-clays”) and more. Check out the schedule of events to learn about openings, signings, and other special events. 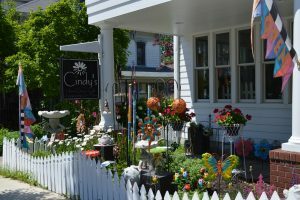 The Saugatuck area is loaded with great galleries, so see the complete list and make your plans to visit soon! You will find things you never expected in the many small shops nearby. Many visitors spend entire days going from place to place shopping for rare and one-off items. From antiques and home furnishings to just plain fun stuff, the shopkeepers in our town provide a comfortable and interesting experience for all visitors – an experience that many of our guests return for time and again. Looking for gifts that can’t be found anywhere else? Looking just for gift ideas? Just take a walk and you are sure to find something surprising. Not all art is painting and sculpture! Enjoying a good meal at one of our fabulous restaurants provides a relaxing opportunity to reflect on the day’s adventures. And the food is fabulous! Why shouldn’t it be? We are in the heart of the Michigan farm belt where we bring in the freshest foods and produce available. Combining that with some culinary creativity provides dining experiences you won’t find anywhere else. 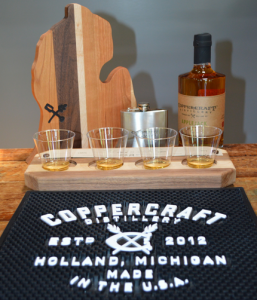 Craft brewers and distillers also call the Saugatuck/Douglas/Holland area home! You can sample their products at various sites and events throughout town. If you are interested in learning more about how great tastes get from farm to table, try a Hungry Village Tour! These start at the Saugatuck Center for the Arts and typically include samples and tastes of what our experts have created. For another unique dining experience, try the Salt of the Earth in nearby Fennville. If you enjoy good music with your meal, this is the place! The Saugatuck area offers many different dining options. Be sure to check with the innkeepers at Twin Oaks Inn for recommendations!